In this episode, Martha offers a primer on a favorite crustacean. She explains which varieties of shrimp to buy and how to store them, plus whether to cook them with or without the shell and how to devein them. Basic cooking techniques result in delicious recipes for shrimp cocktail, an updated version of shrimp scampi, a traditional shrimp boil and simple grilled shrimp. In this episode, Martha Stewart offers a primer on a favorite crustacean. Martha Stewart shows how to peel and devein shrimp. 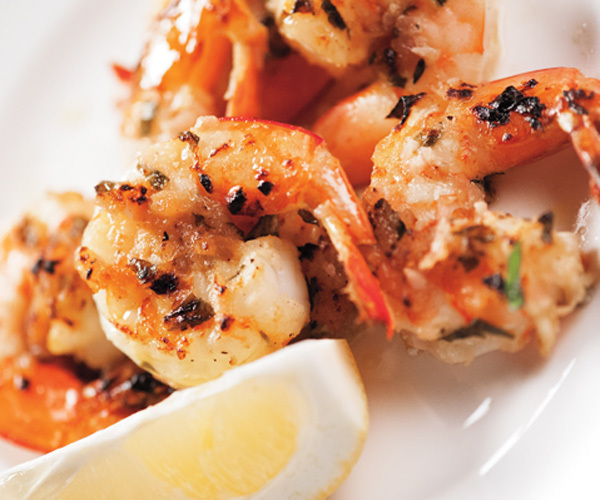 This grilled shrimp recipe appears in the "Shrimp" episode of Martha Stewart's Cooking School. Use a paring knife to cut along back of each shrimp shell, leaving shell on head intact; remove vein. Transfer shrimp to a shallow nonreactive dish. In a small bowl, stir to combine lemongrass, chiles, coriander, garlic, lime, and oil; pour marinade over shrimp. Cover; refrigerate overnight. Heat grill to medium-high. (If using charcoal grill, coals are ready when you can hold your hand 5 inches about grates for just 3 to 4 seconds.) Remove shrimp from marinade, wiping off excess, and season with salt and pepper. Skewer shrimp from head to tail and grill until shell is slightly charred and shrimp are cooked through, 3 to 4 minutes per side. Serve hot with a squeeze of fresh lime juice.